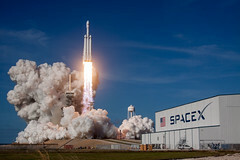 Much-anticipated launch of a SpaceX Falcon Heavy rocket yesterday out of KSC Pad 39A: three F9 boosters strapped together, with a Tesla Roadster mounted atop the upper stage as a test payload. Two side boosters returned for a synchronized double landing at CCAFS, while the core booster aimed for a barge landing in the Atlantic (but missed and went through RUD in the water). The Tesla Roadster, while definitely a frivolous indulgence on Elon Musk’s part, made for some amazing visuals as cameras sent back live views of the car, spacesuited “Starman” posed in the driver’s seat, backdropped by space and a shrinking planet Earth. After a departure burn, Starman and its car are heading out past Mars to the asteroid belt. 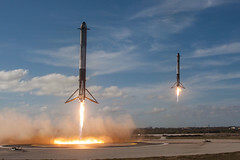 Amazing remote camera photos photos from near the launch site from Kraus, Mahlmann, and Killian, Studwell, and Walters.